Following the wonderful Klimt exhibit, L'Atelier des Lumières has once again inspired awe. In an abandoned warehouse, Vincent Van Gogh's infamous work, "Starry Night", was projected. The effervescent piece of art filled the walls, floors, and ceiling with the iconic, luminous, spiraled stars. 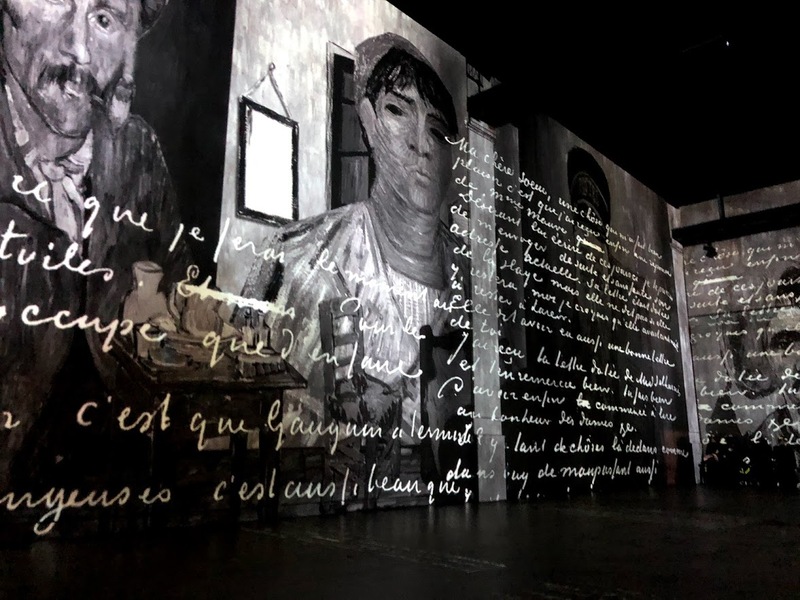 The transformative exhibit entitled "Van Gogh, The Starry Night" is featured at L'Atelier des Lumières, an experimental art projection show that features re-imagined masterpieces in an unconventional warehouse setting. The Van Gogh installment follows the extremely successful Klimt exhibit. The art house's current exhibit has three parts: the main longest duration piece, which focuses on Vincent Van Gogh's Starry Night, followed by a short duration piece called "A Japanese Dream" designed by Danny Rose, an immersive visual and light group of artists based in Paris. After this piece comes another short contemporary piece called "Verse" by artist, Thomas Vanz, that explores what the birth of the universe would potentially look like. The main exhibit of the installation takes a look at the complex emotions and artwork of the infamous Dutch post-impressionist painter of the 19th-century artist, Vincent Van Gogh. His artwork that streams across the wall, and is a true display of his emotions that speak through his use of light. The music choice adds a secondary impression to the interpretation of the art, with beautiful songs like Nina Simone's, "Don't Let Me Be Misunderstood." The jazzy and raw emotions of the song carry through and complement the pieces. The show then focuses on the perspective ups and downs of Van Gogh's life. Each brush stroke carries with it an additional emotional state. The longest piece of the exhibit continuously captivates the viewer by moving from scene to scene in a fluid fashion, making the exhibit a breathtaking must-see. ADL JD 3 from Jackson Vann on Vimeo. "A Japanese Dream" truly feels like its title: a dream. Through the combination of music and beautiful delicate cherry blossom flowers falling from the ski, creates a trance-like experience. From samurai warriors and demons to geishas and kitsune (a Japanese fox spirit) the projection draws the viewer into the magical world of Japanese folklore and myths, moving them from the magical forests below Mount Fuji to the depths of the Pacific ocean and then to the rice patties of the wealthy. Each new scene is truly magical and pulls the viewer to the brink of reality, it's further aided by the mystifying traditional Japanese music. The ukiyo-e, the Japanese artistic movement from 1672-1860s, is also heavily featured throughout the exhibition and draws on the connection between Japanese art and its influence on Van Gogh. Danny Rose truly encapsulated this artistic movement and was another beautifully executed piece similarly to other works like their closing ceremony of the 2002 Winter Olympics. This exhibit was a truly mystifying and beautiful piece. "Verse" the short and abstract piece that explores the birth of the universe features millions of stars that illuminate the whole space, spinning across the wall as universes explode and combine into infinite combinations. The orchestral music makes this piece truly hypnotic. Though not as long as the other pieces "Verse" evoked a supernova, cosmic experience. All three pieces were incredible and this exhibit is a must-see, for both art fanatics and more casual viewers alike. Each piece has a beautiful story to tell that relates back to Van Gogh's art, and the Japanese influence to the awe-inspiring beauty of the sky. L'Atelier des Lumières is located at 38 rue Saint Maur 75011 Paris. **Due to its popularity, it is best to buy the tickets in advance as they are often sold out the day of. Tickets are €14,5 for adults, €11,5 for students, and €9,5 for ages 5-25. Tickets can be bought online at this link: www.atelier-lumieres.com/en/node/834.